Carbohydrates and protein are two macronutrients essential for optimal energy and proper health. Foods that offer both nutrients in large amounts are healthy additions to your diet. Identifying high-carb, high-protein foods can be challenging, but they are found readily in any supermarket. High-protein and high-carb foods are valuable for endurance athletes and people looking to gain weight, but can fit into any diet plan. Carbohydrates are the body’s primary source of energy. Protein is a component in every cell in the body and helps with muscle development and function. The Institute of Medicine recommends consuming between 45 and 65 percent of your daily calories in the form of carbohydrates and 10 to 35 percent of daily calories in the form of protein. Meats, poultry and fish are high in protein, but most contain no carbohydrates. High-carbohydrate foods such as baked goods, starchy vegetables, bread, fruits, grains and pasta tend to be low in protein. A limited number of foods feature both high carbohydrates and high protein. Proteins are made up of amino acids, some of which must be obtained from your diet. Combining plant proteins with a grain such as rice or whole wheat pasta provides you with all the amino acids your body cannot produce on its own, and increases the carbohydrate content of your meals. For example, 1 cup of black beans with 1/2 cup brown rice makes a meal with 18 grams of protein and 64 grams of carbohydrates. Cheese pizza is another complete food that offers 12 grams of protein and 34 grams of carbohydrates per slice from a 14-inch pie. Consuming high carbohydrate, high protein foods such as beans and quinoa provides you with extra fiber. Fiber can help with digestive health and may help reduce your risk of developing heart disease. 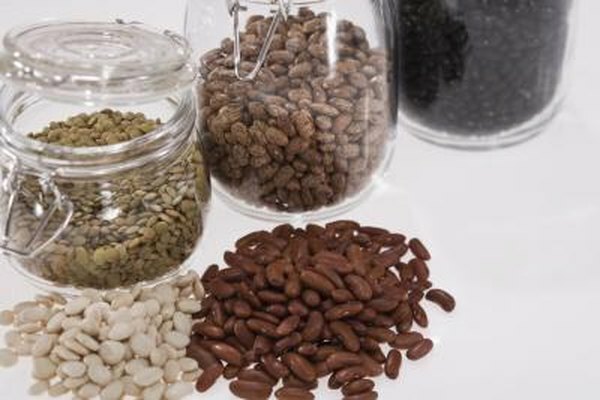 Emphasizing plant sources of protein can also improve your overall nutritional profile as they contain less saturated fat than animal-based proteins.